Forgive me for throwing this story of a birding adventure out onto the internets before the tale of the three 10,000 Birds bloggers getting together on Friday for the first time, which you will all get to read about soon enough, but I saw some pretty darn cool birds today and I couldn’t wait to write about them! On Friday our plans to head upstate in search of winter rarities were scotched when a winter storm made the distances we needed to travel unfeasible so I decided to see if I could find some of the birds on my own on my way back upstate to Albany from New York City today. My first goal? The Hoary Redpoll which has been frequenting feeders in the town of Montgomery in Orange County. A Hoary Redpoll is essentially a bigger, whiter, and rarer Common Redpoll (if you want more information than that about how to tell the two apart please go see David Sibley’s excellent series of posts about redpolls). The one in Montgomery has been visiting Curt McDermott’s feeders for over fifty days now, which is fortunate because Curt is a birder and he was pretty sure he knew what he had when he saw it. Many birders have been to see the bird and Curt, by all accounts, has been a gracious host (to birders whom he welcomes and to birds, for whom he puts out over a hundred pounds of seed every three weeks!). Curt showed some marvelous birding etiquette today when I pulled up outside of his home to view the feeders in his side yard. He was outside sitting with his camera, waiting to get the perfect shot of the bird. When I arrived he decided to go inside, despite my objections, because he felt that his presence near the feeders was keeping the bird from showing. Sure enough, within ten minutes of his heading in the bird showed! Not only did Curt prove himself the ultimate host of a rare bird by displacing himself from his own yard, but after the bird showed and he found out it was a lifer for me he presented me with a great picture of it, taken by one of his visitors, which he said was a necessary memento of getting a lifer. I’ve said it before and I’ll say it again, Birders Rule! But after my latest addition to my life list I wasn’t done yet. On my way out of Montgomery I gave a call to Chrissy, who lives near there, to let her know I had seen the bird. She suggested a back road I could take that would lead me directly to Humpo Marsh in New Paltz where Red-headed Woodpeckers are known to be. Who am I to say no to what would be only my second look at such a wonderful bird? So I headed up the Albany Post Road to 299 and, unfortunately, dipped on the woodpeckers. Sure, I saw a gorgeous male Northern Harrier hunting the marsh and Swamp, Song, and American Tree Sparrows, to say nothing of a Northern Flicker and a Downy Woodpecker, but I was still kind of bummed as I headed back to the New York State Thruway entrance in New Paltz. What might not be terribly obvious in the lousy pictures is that the bill is bright orange and it seemed to be at least as large as the larger Canada Geese (though the range was great and the birds were in different postures and at different distances). Congrats on the Hoary! I am still waiting for mine to first show up! It’s only a matter of time, right? 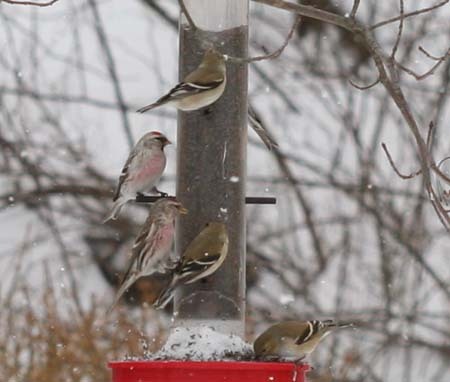 I dunno about that Redpoll… Looks like a very pale one, now what’s the term I’m looking for? Oh right, “Hoary”. Congrats. Hoary Redpoll was the bird that launched my birding career. Thanks to all those who didn’t believe my sighting! @Will: Career? You’re making a living off of birding? My guess on the goose would be a (domestic) Greylag, maybe mixed with Canada (more likely) or Greater White-fronted (less likely). I have seen such a mix locally on occasion. Usually it resembles GWF in almost all respects except size. It tends to be as big as the local Canadas, instead of smaller as a GWF should be. But it is hard to say without a clearer photo. Yes, I write myself a check each week, but it keeps bouncing. 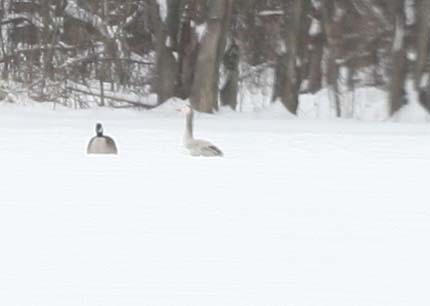 GWF Goose is actually pretty small when compared to a Canada and hybrids between them are uncommon even where range overlaps from my experience. I think it’s a manky goose. Big orange bill certainly suggests Greylag to me. I’m guessing a Greylag goose, too. I snapped some pictures of what I thought might be Snow Geese, but later found out were actually Greylag. The one I posted on my blog had a white face like yours, too. I believe I’ve seen this goose 3 times. It is fully as large as a canadian and built the same .White face ,gray neck and dirty white body ,orange bill and long orange legs. The goose is EXACTLY like four that we have been seeing all winter at Blue Chip Farm which, as the goose flys, is not very far from where you had your bird. They are definitely hybrids between Canada x probably a barnyard Greylag type of which just such a one happens to exist at the small pond on upper Bates Lane at Blue Chip. Congrats on seeing “Frosty”, Curt’s tame Hoary – you join a throng which now numbers over 300 that have stopped to enjoy that rarity. A “lifer” for most, including me! @Curt: Thanks again for being such a good host. Did you ever figure out what kind of goose you saw? We live in Ontario and we’ve seen the same kind this fall.